As reported here on Oct. 14, Disneyland workers celebrated a huge triumph for labor in September when they voted for a contract that significantly improved their situation in terms of pay, safety, and workplace rights. They managed to secure an important victory not just for themselves and their families for workers across the nation. They stepped up. Many stepped beyond what may have been a more comfortable inactivity in the shadows to speak out about the conditions they faced. Many workers took action for the first time in marches and in speaking to the press. The unions devoted considerable resources to assisting in the mobilization. Plans were made. The union’s organizational priorities were set. Actions were taken in accordance with the plan. Along the way, heads were counted, more people became involved and a movement was built. New leaders came forth and older, veteran leaders became more steeled and more valuable. Second, unions worked to achieve unity. They coordinated bargaining and actions among the unions representing workers at Disney. And they formed a number of coalitions (mentioned in Part I) for the bargaining process. But they also formed the Coalition of Resort Labor Unions to coordinate resistance to Disney cuts, restrictions on sick leave, and access to the park for employee families. 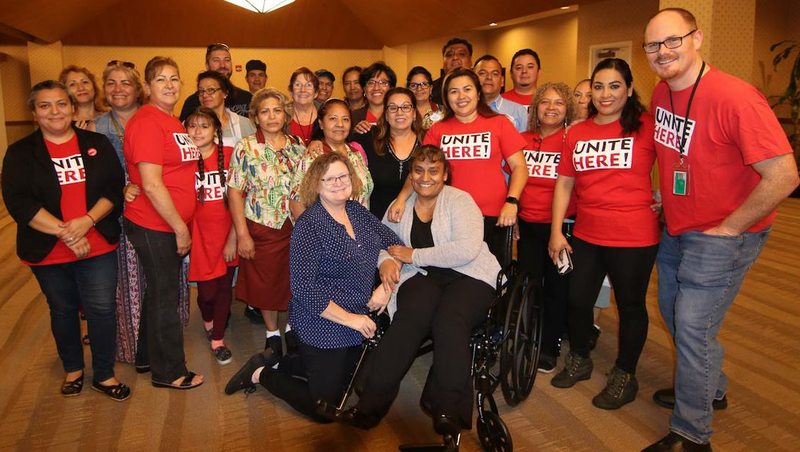 This coalition includes all of the unions in Anaheim, including Workers United Local 50, whose contract, covering 6,000 food service workers, does not expire until 2020. Third, they created a movement with action. The last year was filled with so many actions that it created a virtual movement that exposed how Disney created poverty. On October 14, 2017, Orlando UNITE HERE Locals 362 and 737 joined the large Orlando LGBTQ pride march with signs saying, “Disney Workers Need a Raise.” Those locals are respected in part because of their history of securing lesbian, gay and trans rights in their contracts. Those rights would not exist if it were not for the union. There are no federal protections and there is no state law that bars discrimination against gay workers. Orlando has some protections, but again only because of historic pressure by workers. Five days later, Orlando unions rallied with such size that they blocked a main entrance into the theme park, and were dislodged only when the County Sheriffs broke it up. In February, the Anaheim-based Coalition of Resort Labor Unions held a huge meeting that highlighted the report on the poverty wages Disney was paying. The coalition was supported by the Orange County Labor Federation, by AFSCME Local 2076, and by community groups such as the Orange County Communities Organized for Responsible Development and Clergy & Laity United for Economic Justice. This meeting also announced the campaign to put an initiative on the ballot to raise the minimum wage to $15 beginning Jan. 1, 2019, for all workers, beginning for all workers in the Anaheim resort area whose employers got tax breaks or subsidies. The wage would go up $1 per hour more each year through 2022. The largest company to be impacted by this is Disney. That February action set the stage for the March 8 action at Disney’s stockholder meeting in Houston, Texas. Workers from both coasts demonstrated at the Disney stockholders meeting in Houston. They demanded a living wage, while on the inside the CEO was maneuvering for a compensation package for himself, worth hundreds of millions. By June, the protests intensified. National attention was focused on Disney by an Anaheim Town Hall meeting chaired by Bernie Sanders. Disney was so worried by that time that it put out a proposal just before that meeting saying that it would agree to a $15 wage sometime in the future, but without the other guarantees that the workers were fighting for. Workers hit the streets several times in June and July. And there were struggles at the Anaheim City Council to counter Disney’s moves to undermine the ballot initiative. Disney was on the defensive by the end of July when they agreed to the first contract, just as another protest was about to begin. One poll done in mid-June showed that the ballot initiative for $15 an hour was more popular than Disney itself. A key element in the campaign was the involvement of community groups. The unions reached out to the community by not only expressing solidarity with community struggles (like housing, for example) but also by being involved in the immigrant rights movement. 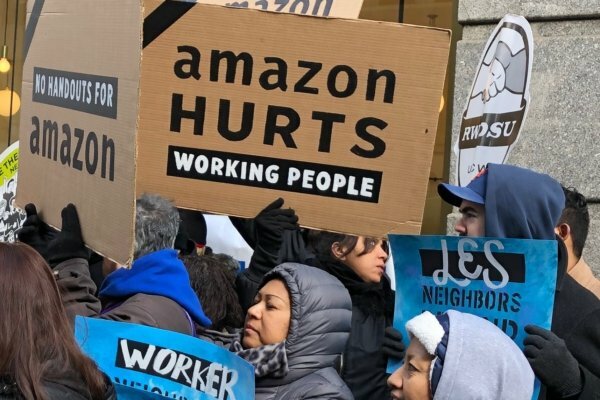 They showed through action that they are for broader numbers of people winning a $15 minimum wage by next January, and they have invested significant resources to make that happen. Fourth, they outmaneuvered Disney by going to the people and getting an initiative on the ballot. consistently threatened to leave Anaheim and up to now they have always won. The idea came up again in 1991 and was defeated. In October 1996, City leaders dutifully agreed to issue a $560 million bond to finance parking structures, a convention center and other improvements for Disney. Once the bond was paid off the parking structure would be given to Disney. In the meantime, as it waited for ownership rights, the company was taking the parking revenue. Disney agreed to invest $1.95 billion in expansion to its resort, which of course was simply to increase its own profits. But that’s not all; Disney got the city to agreed to an “Entertainment Tax Policy” banning city taxing gate admissions and parking for 20 years. And just in case voters wanted to pass an initiative to tax Disney, another mechanism was created to funnel money back to Disney for 45 years. In July 2015, as the 20-year period was drawing to a close, despite protests, the Anaheim City Council voted to extend the ban on gate taxes at Disney for another 30 years, again based an agreement for more investment aimed at creating conditions for increasing its own profit. Disney talked about building a “Star Wars”-themed area. If the city had simply imposed a $1 tax on Disney for each ticket they sold, estimates showed that the City with tens of thousands of poor people would have gotten $1 billion. This Disney demand arose in the midst of increasing community organizing demanding housing for the homeless, and for community control over the police. The contrast between public welfare for Disney corporation and the actions taken by the City Council to essentially criminalize the homeless was clear, and energized protests. But Disney employed its troops and most importantly its dollars. During the 2016 election for the City Council, it contributed over $1.2 million to a number of political action committees to assure that they would have the votes to get the subsidies. Their contributions were under the radar until an expose came out in September 2017, after the election and the vote on subsidies. In February 2018, when the Coalition of Resort Unions launched a campaign to get an initiative on the November ballot for a $15 minimum wage by January 2019 and $18 by 2022, they connected it to those companies getting tax subsidies from the city of Anaheim. Disney tried to undermine it with counter proposals. Then they tried to press the City Council to delay it with economic impact studies or kill it. But this time in June 2018, the unions and community had mobilized enough pressure to prevail. Disney could see the community opinion shifting clearly in favor of the wage increase. The exposes were hurting their image. By the end of July, Disney was beginning to agree to contracts with the workers. On August 10, they agreed to raise the minimum wage for non-union hourly workers to $13.90 then $15.75 in January. Within days they announced that they would not build the new 700-room luxury hotel that was tied to the 2016 City Council agreement, to let them keep 70 percent of room taxes paid by guests at the new hotel for 20 years ($267 million). Various excuses have been offered to justify this change, but the timing shows that at least a significant part of their calculation was the movement’s work of targeting subsidies and exposing low wages. The fewer subsidies that they had on the record, the stronger their argument that they would be exempt. On August 22, Disney asked that the $267 million subsidy be cancelled and on August 27, the City Council agreed. The Orange County Business Council tried to put the best face on this defeat for Disney and win for the community. They said that Disney was wise to play the “long-game.” In fact, there would have been no long game, or plan B, if it were not for the struggle of the people. Within the same week, the Orlando Florida Service Trades Council announced a tentative agreement with Disney. And within three weeks, Disney finally agreed to a contract with UNITE HERE Local 11 in Anaheim. The workers’ struggle on all fronts led to this victory. They created the pressure to make Disney do what it otherwise would not have done. The unions are still pressing forward to pass the initiative to raise the wage and improve conditions for thousands more. All in all, though this was a major win and an example for others about what is possible. 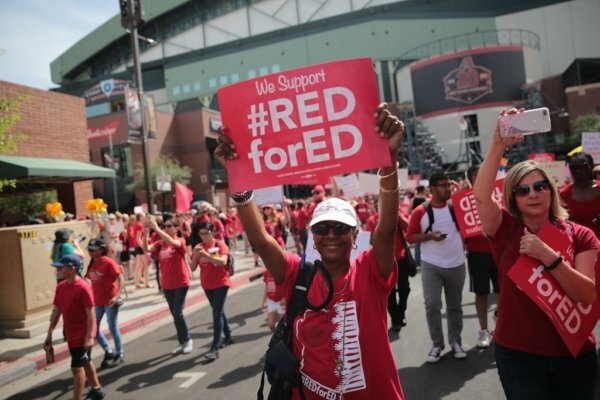 UNITE HERE is continuing to work to pass Measure L in Anaheim. There was no agreement to drop that effort. UNITE HERE Local 1 is also leading a city-wide strike of hotel workers in Chicago. Thousands have marched. Already contracts have been won at 15 hotels, like the Palmer House . In addition, over 8,000 Marriott workers have authorized strikes in six major cities. UNITE HERE is also helping 2,700 United Airline workers win a union voice. The voting by in-flight catering workers is going on right now. Their stories can be found here . IATSE Stagehands just won union representation at the FirstOntario Arts Center. BCTGM is continuing the campaign against Mondelez with an international meeting of unions from around the world. Along with the Teamsters, it is also putting a spotlight on Coke for its human rights abuses. Despite Trump’s attacks on labor and the Democrats quiet or non-existent response, labor is winning hearts and minds. Polls have shown the highest public approval ratings for unions in 15 years. The possibilities for struggle and winning are on display in the Disney strike. The next step is for others to follow their lead.